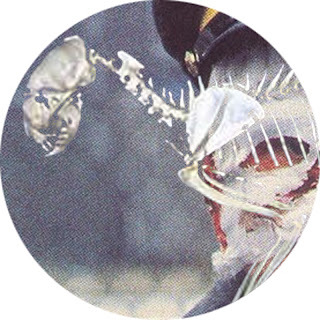 Here is another fragment of music for you. This is a portion of Beethoven's 'Heiliger Dankgesang', or song of holy thanks. It's a magnificent example of modal writing, with barely any accidentals in the long exalted passages from which my little transcription comes, and an all-over mood of almost unbearably serene melancholy. 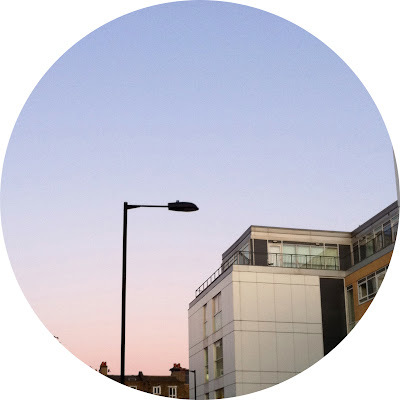 If you're not already familiar with it you might actually recognise the piece from its use in Keiller's 'London', where it bestows the drabness of quotidian London with an exquisite shimmer of yearning. I've got a few articles, reviews, lectures in the pipeline. I'll try to remember to let you know about them when they turn up, try to get the muddy, near-ossified juices of self-promotion flowing. This is a little sketch I made, featuring a little clip from the cheery kitchen sink/apocalypse TV drama 'Threads' from 1984. I guess the fact that the clip shows a crackly vhs recording of a BBC children's educational programme being played to post-nuclear holocaust weans puts this very much into the venerable tradition of hauntoyadayada. Everybody knows when the dream of modern architecture died, don't they? Depending on which side of the Atlantic you are from, there are two events that supposedly mark this particular failure out. Americans generally point to the demolition of the Pruitt-Igoe housing project in 1972, most famously highlighted by Charles Jencks., while in the UK we have the May 1968 partial collapse of Ronan Point tower in east London (a quick aside - on the old black and white 'Eastenders' title sequence you can see the shadows of the Freemason's Estate just to the north of the western end of the Albert Docks). But there is another symbolic event at which modern architecture supposedly became suspect and untrustworthy, when the concrete veil was lifted and we saw modernism for the mistake that it had always been, yet it's an event that seems to have been dropped from the narrative. In many ways it is a more damning and terrifying indictment of architectural practice and negligence in the post-war period, and yet it no longer has quite the same symbolic cache as the previously mentioned events. In this post I'll describe the building, and try to explain why it's actually a more complex and in some ways more appropriate symbol for the failure of the modernist project. 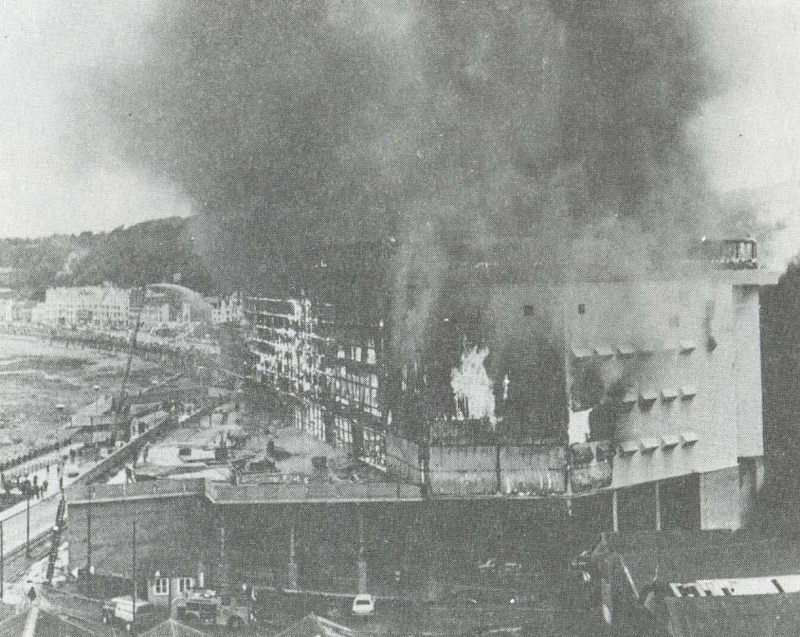 'Summerland' was an indoor entertainment complex in Douglas, the Isle of Man, which on the evening of the 28th June 1973 suffered a massive fire which killed 50 people. The fire was started accidentally by a group of children who were hiding outside smoking, with a discarded cigarette causing a small fire that made its way into the exterior walls of the building. This fire grew, out of sight, before breaking out into the main hall, and within minutes the entire building was ablaze, with 3,000 people hysterically clambering over each other to escape. The disaster was in many ways similar to other tragedies of its type - visitors were unaware of escape routes, while some of the doors had been locked shut by the management as a way to prevent people from sneaking in without paying. There was also a delay in the evacuation of the building, which didn't begin until the fire had already engulfed the interior - in addition to this, the fire brigade were not called for almost half an hour after the fire started due to poor safety training of the staff. 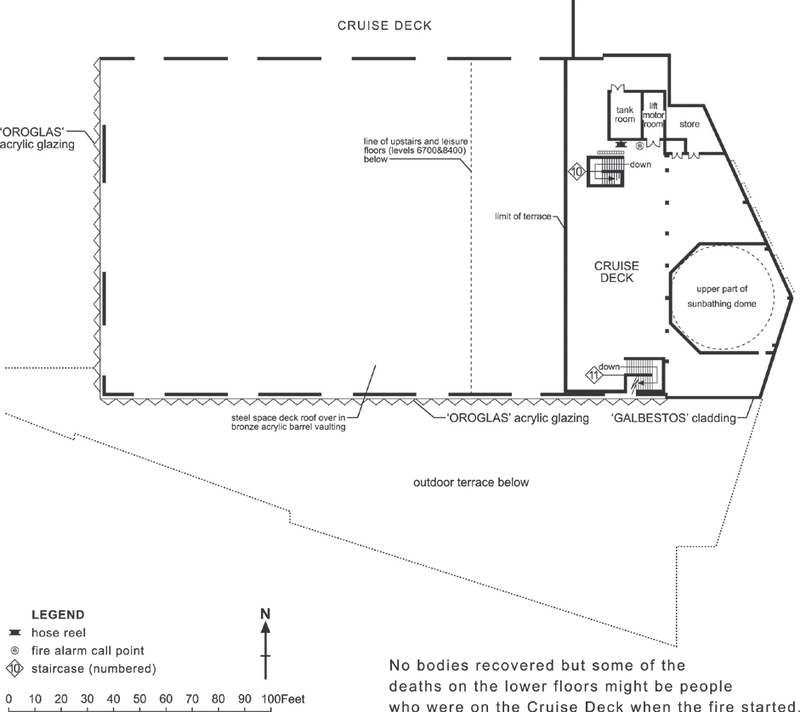 In a subsequent enquiry these were the most significant factors in determining why there had been such loss of life. 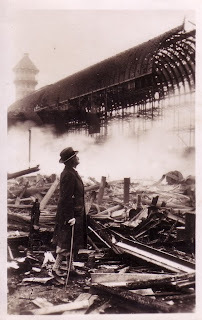 But there were other significant failings - ones which inevitably damaged the reputation of architects and engineers. 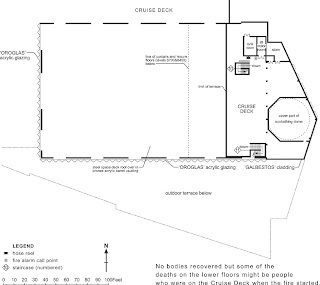 One of these was genuine, and serious; the internal layout and the means of escape in the building were wholly inadequate for a building of its type, with a single large open staircase the only obvious route down; this staircase was overwhelmed during the escape, and half of the bodies of victims that were later found were on this staircase. Furthermore, and in a development that brings to mind John Poulson and the image of the brown envelope-handling poltician and architect, there was a blatant flouting of the normal building regulations. 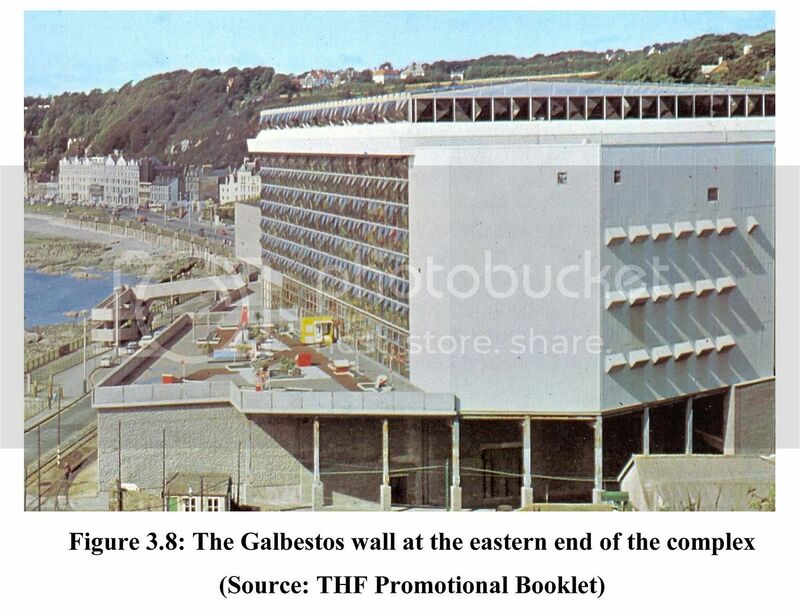 The external wall that the fire started below was built from 'galbestos', an un-fire rated panelling material, chosen to save money - it was suggested that if it had been concrete then the fire would not have spread. 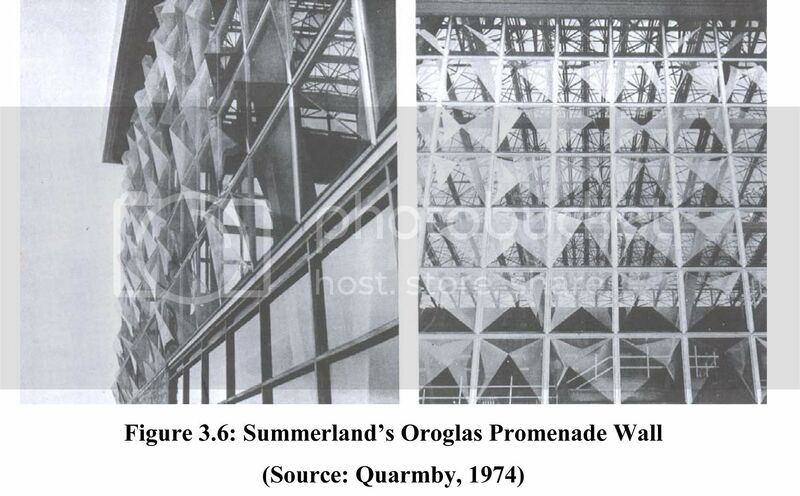 The 'oroglas' transparent acrylic that was used for the façade and roof was known to be flammable, but somehow during the design process the architects managed to get a waiver for the material, relying on manufacturer's claims that when heated the material would soften and simply pop out of its frame, an untested supposition. During the disaster, the oroglas ignited rapidly, greatly increasing the ferocity of the fire, and causing molten plastic to drip down onto those desperately trying to escape. In the immediate aftermath of the disaster the press developed a narrative whereby this untested and dangerous material was a major contributing factor to the disaster, and although this was later shown to be mostly untrue (the oroglas ignited late in the conflagration, and it was later realised that most if not all of the casualties had already occurred by then), the narrative of the modernist architect foisting a dangerous and untested material onto an unsuspecting and vulnerable public was a dramatic one, and one that seeded itself in the distrust of modern architecture that would fully develop in the following decade. 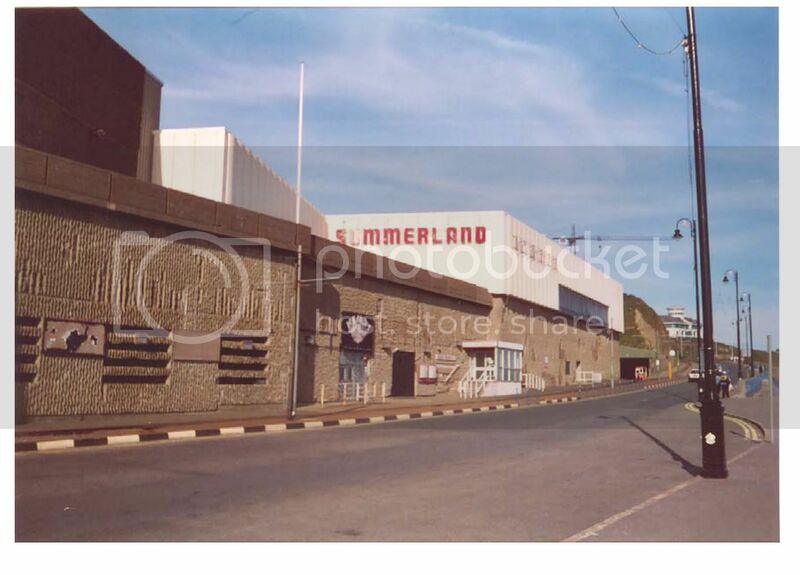 But beyond the horrible events of that day, the Summerland building is a remarkable building as well, both in terms of its functions but also its position within a historical context. It deserves to be studied, certainly not as a work of architecture of any note, but as an early attempt at actually building a radically new idea of the time. Outside of the tragedy itself and the historical effect it would have, the Summerland building was unique. 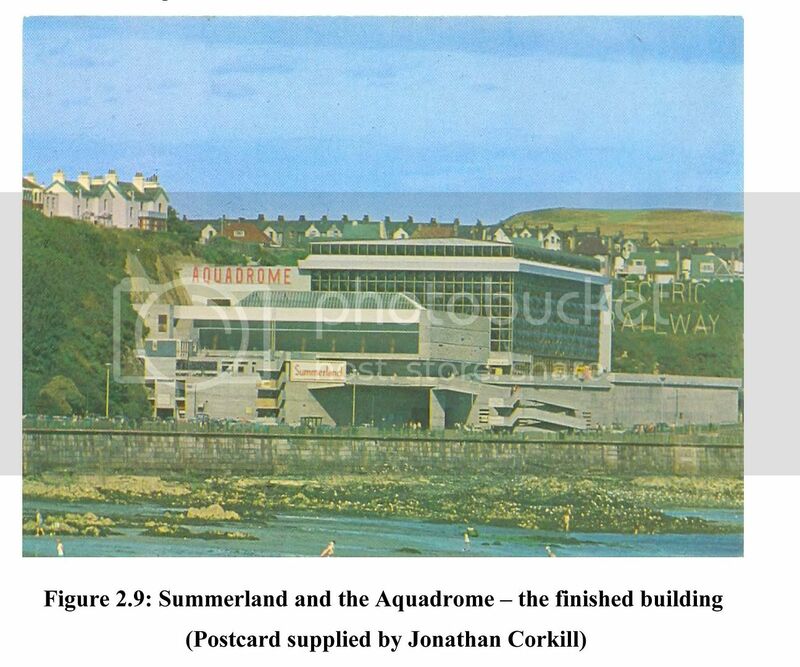 The decision to build Summerland was born out of demographic trends in the 1960s - the generally increasing standard of living meant that more people were taking foreign holidays, and often for the first time this included the working classes. 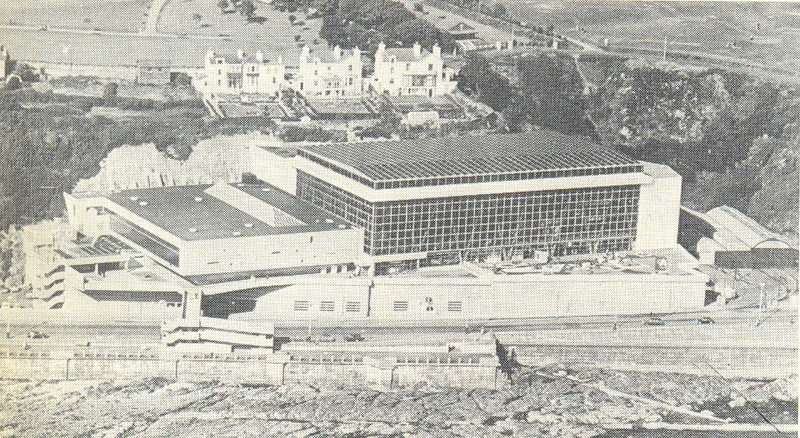 Douglas on the Isle of Man was a traditional summer holiday destination, but it was moving into decline as the 60s wore on - it had pretty average weather and a lack of facilities or entertainment venues. The solution that was put forward by the government of the island was for a modern leisure complex to be created that would encourage tourists back to the island again. 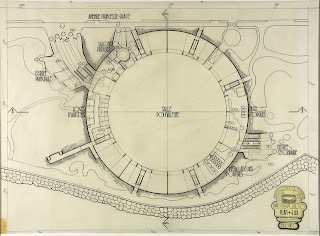 An architectural competition was held with a very vague brief (basically; "a swimming pool and whatever else you think might be useful"), which was won by a local architect, James Phillips Lomas, who presented a remarkably avant-garde design. 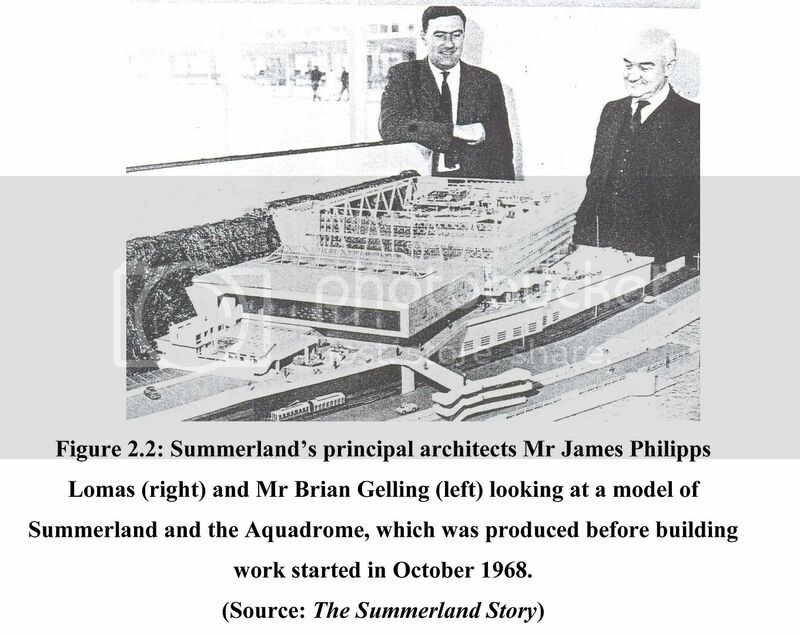 The proposal for Summerland basically consisted of two main phases; one was an Olympic-size swimming pool complex entitled the 'Aquadrome' and the other, 'Summerland' proper, was a massive single enclosed space into which all manner of entertainment programme was to be inserted. 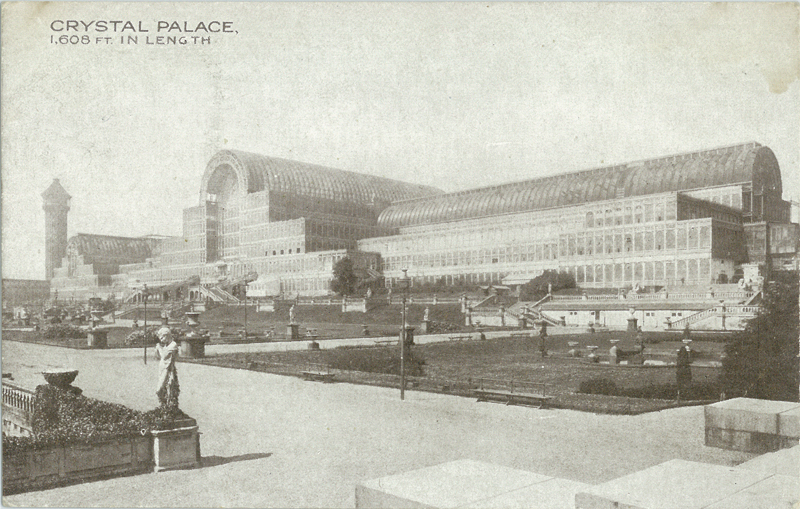 With a footprint of about the size of a football field, and a single 30m high roof, it was a huge, singular air-conditioned environment, designed to create a pleasant microclimate throughout the year no matter what the weather, its vastness giving the impression that it the visitor was actually outside on a wonderful summer day. The space was supported on a large truss of steel columns, with a space frame roof spanning across the top, and into this structure were inserted the oroglas panels, chosen over glass for their strength, their lightness and their ability to control solar gain. Summerland was designed to offer the visitor absolutely everything that they could get from, for example, a Spanish holiday resort. 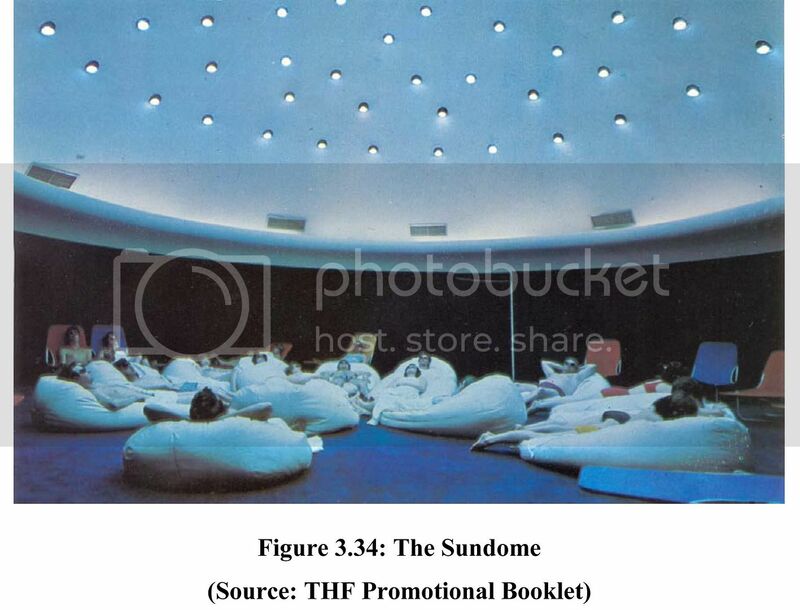 Into the cavernous greenhouse were built a number of terraces, with programme including an amusement arcade, a restaurant, a number of bars and a futuristic tanning room called the 'sundome'. 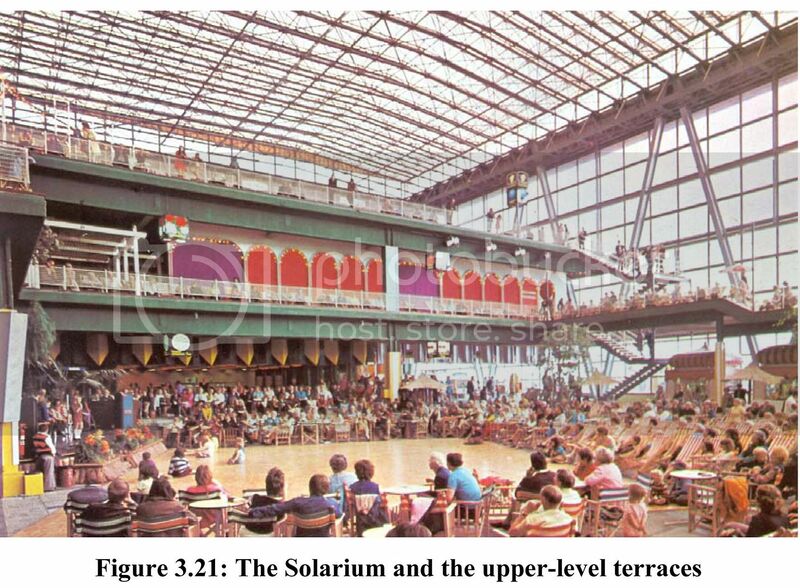 Underneath the solarium were children's entertainment and amusements, and a basement disco. In total the building was capable of holding 10,000 visitors at any one time, a rather huge amount of people to be freely moving around in just the one complex. The interior was kitted out with a very strange array of styles, from the deck chairs and stripy canopies associated with the Great British Seaside, to the 'timber Helvetica moderne' interior style that was common at the time, to the total kitsch of the interior waterfall and 'rustic walkway' made of logs, to the crazy high-tech communications tower, and the plastic tat of the bingo hall. At the architectural scale the building represented a strange hybrid, a transitional architecture stretching forward but unable to escape its own time. The majority of the building was constructed in a rather unsophisticated brutalist manner - the swimming pool and the lower storeys of the solarium were almost entirely windowless concrete lumps, with none of the flair of a Rodney Gordon, another architect operating at the same time at the similar end of the commercial scale, and yet capable of magnificently bold and clever designs. 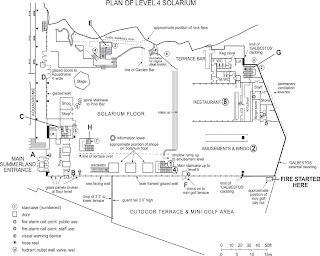 The solarium, however, is an embryonic example of the architecture that hadn’t yet managed to make itself felt as 'high-tech', the steel and glass mode that has now taken over the world; the solarium was spare, structural, it receded in a way that concrete doesn't. It was an example of architecture as attempted dematerialisation. After the fire, it is really rather astonishing that Summerland was not immediately demolished, considering the horrors that had occurred there, but it was decided to rebuild the complex in a less risky and ambitious fashion. 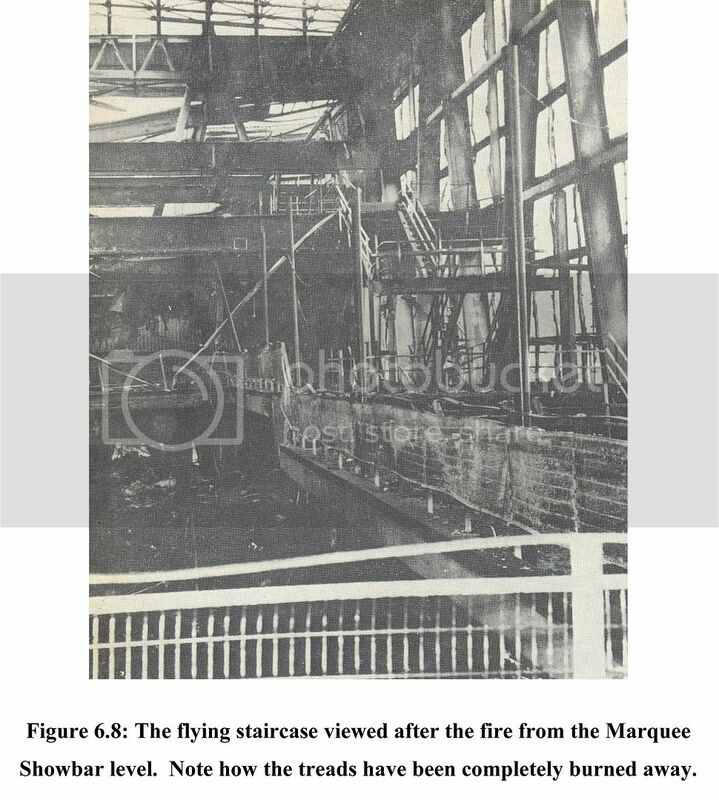 The swimming pool had suffered comparatively little damage from the fire, as did the concrete floors underneath the solarium. Instead of the massive airy enclosure however, the replacement was a single storey box with barely any windows to the side, supported under a gloomy space-frame roof. 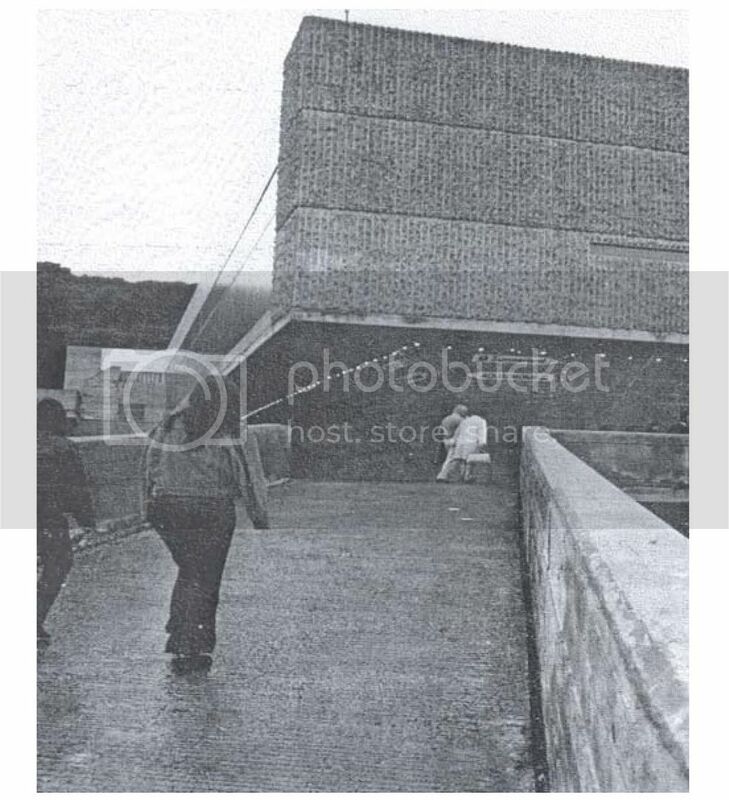 The pedestrian bridge across the road was sliced off, and the concrete facing the sea rotted away to the reinforcements, leaving the building looking about as sorry as it was possible for a building of that period to really appear. Although apparently still valued by locals, the new, diminished Summerland never managed to maintain profitability, and it was eventually demolished in 2005. There are a number of resemblances that I'd like to point out here. 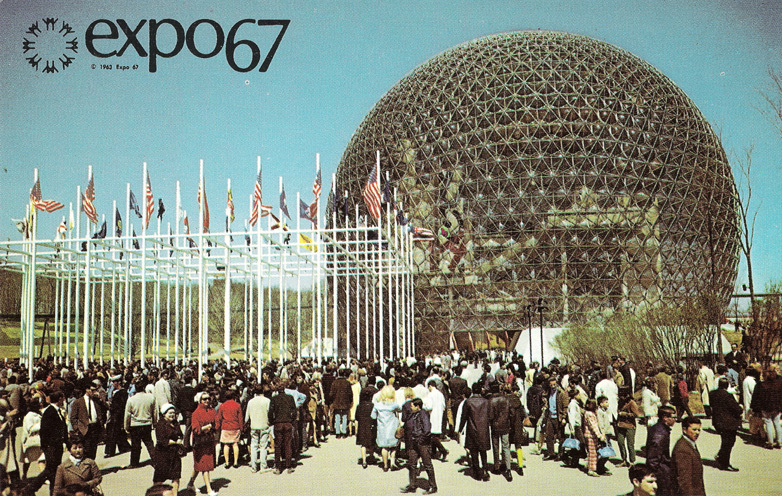 The first is a rather uncanny one; the USA pavilion at the Montreal Expo, 1967. 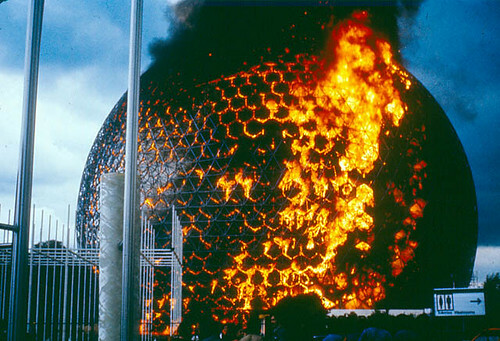 On a superficial level, Buckminster Fuller's geodesic dome has two major resonances with Summerland - the dome of the expo building was not only entirely clad in oroglas, but it too was consumed by fire, although without any loss of life. 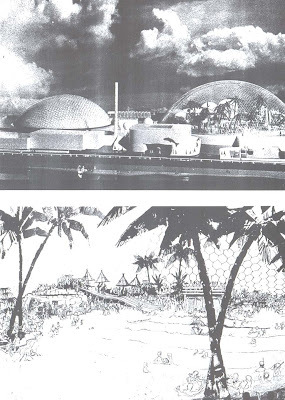 But furthermore, both of these structures were attempts to create massive interior, climate controlled and hospitable spaces for activities within. This was very much part of the utopian culture at the time, with the prospect of moon bases and the rise of the consideration of architecture in terms of serviced space rather than form and void - Banham's 'Architecture of the Well-Tempered Environment' was published in 1969, for example. 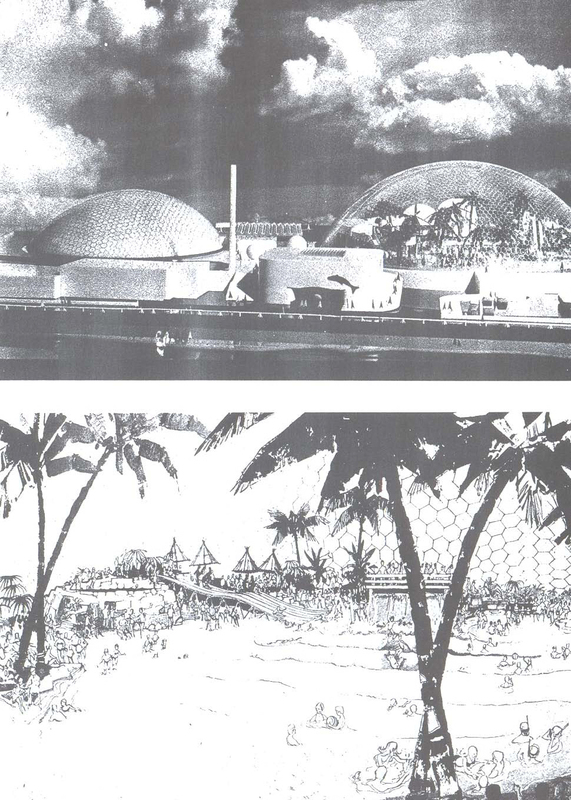 Indeed, it was said that the original concept for Summerland was actually a dome but was lost to cost and construction difficulties - this would seem to be borne out by Lomas' other design for a leisure complex in Hunstanton which looks rather like an early sketch for the Eden Project. But Buckminster Fuller's Biodome was a pavilion of science and lofty thinking, whereas Summerland was entirely an entertainment complex. With this in mind, then perhaps the greatest resonance is with Archigram. The gee-whizz consumerism of Archigram's Zoom ethos was remarkably congruent with the high-tech British seaside resort that was Summerland (even if Warren Chalk gave a patronising review of Summerland in the AJ, calling it a 'rather timid collage'); both had the same emphasis on colour, fun and consumption and the apparent freedoms that they entail. 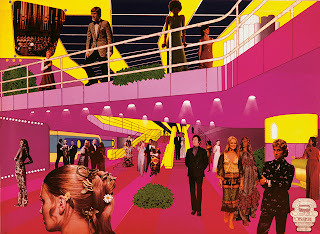 But whereas Archigram's dreams were conjured up by a group of professional men, at least some of whom were of the 'upper orders', and were populated by models and starlets, Summerland was pitched directly at the ordinary worker and their idea of a fun holiday. Furthermore - the great project of Archigram, the one that got away, was indeed a single-purpose entertainment venue, by the sea, contained in a large, continuous single serviced space, although this time it was to be built in Monaco (of course!). 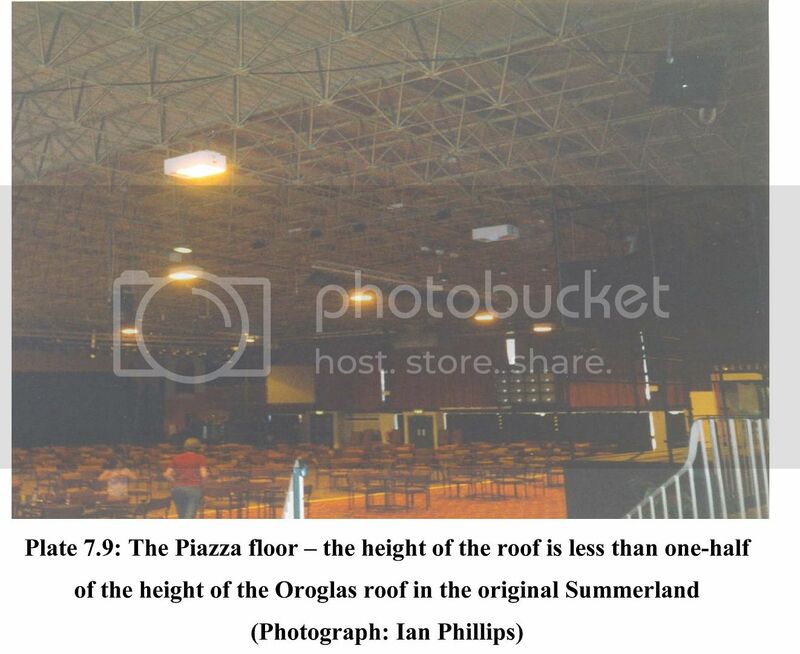 In this case what Summerland represents is a genuine, actually existing example of what an 'applied Archigram' would turn out to be; a concrete test of the flash-whizzy dreams of architects applied to genuine working class lives, which in this case was a fully-sealed space for children's talent shows (although it should be noted that until the disaster, Summerland was making a tidy profit). 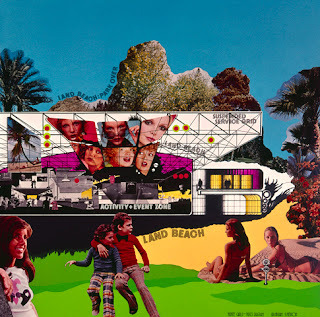 The point here is that Summerland as an idea was no less ambitious than an Archigram event-space, inasmuch as Summerland was genuinely built, genuinely used and genuinely enjoyed, rather than merely pamphleted into academia. Finally, we can go yet further back, and here it becomes rather clear quite why I have become so interested Summerland: there is another historical building, one which synthesises the two oroglas vitrines, Fuller's and Lomas'. 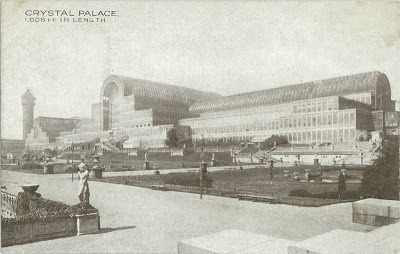 I am referring of course to the Crystal Palace at Sydenham. Here, a single seemingly immaterial interior space of a genuinely unprecedented scale was erected in 1854, with lofty ideals of education and optimism. Again, inside this envelope (or sphere, if you fancy a spot of Sloterdijk) were strewn a varied and shifting set of architectural spaces, styles and programmes. Again, the building was an attempt to create a moderated interior environment that would be akin to a constantly pleasant outdoors. 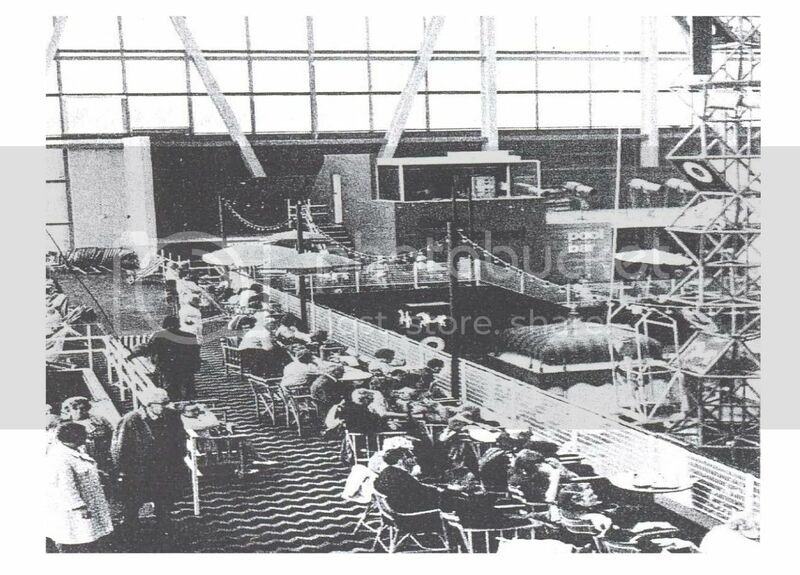 However despite the ideals of its founders that it would be a place where the classes would mix, by the turn of the 20th century it was looked down upon as a place only frequented by the aspirational petit-bourgeoisie, with entertainments and exhibits of a rather kitsch variety. And of course eventually it too would burn down. So beyond merely representing yet another end-point of modernism in architecture, when the negligence and incompetence of its practitioners were laid bare in the most appalling fashion, Summerland actually has a deeper resonance with the architecture of modernity; it is part of the modernism of disappearance, of traceless architecture that recedes behind pure activity and space, of environments defined by freedom. 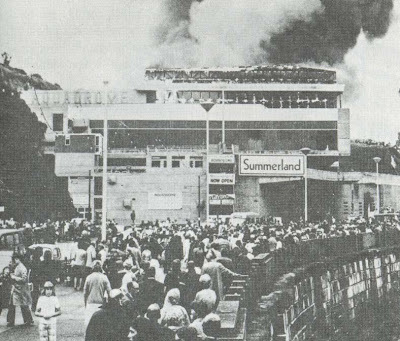 Despite its brashness, and despite the fact that even without the fire and tragedy it would probably still eventually have been a failure, Summerland was fascinating for being a genuine attempt to realise some of the dreams of its time. Note:- This post was greatly helped by a study of the disaster written by Ian Phillips. About a year ago Patrik Schumacher's 'Autopoiesis of Architecture' was released. I read it and reviewed it for Icon here. What I also started doing was writing a detailed review, with the rationale that a work so ambitious needed at least to be given a proper look. The problem is, however, that I never managed to finish the bloody thing, being a) just a mere mortal, not a Herculean near-god like Patrik, and b) really bloody busy. That said, I've been getting a bit cagey about the general criticism that Schumacher gets from people who haven't read the book - I mean, they may well be right about it, but at the same time it's not a firm foundation for criticism. With this in mind, I went and had a look at the thing I had started writing, and realised that I had basically stopped after the exposition, which was more or less complete. 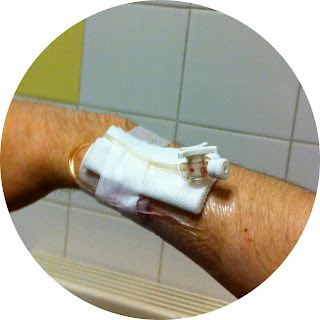 So I've decided to post up what I had completed by the 9th February 2011. It should hopefully function as a fairly neutral guide to what is contained in Schumacher's book, so may be of some help to someone who just has not the time to go through the bloody thing. Hope you find it useful. Patrik Schumacher has written a book. Or two books. Well, sort of. He has written one book, which is so long that it has needed to be split into two volumes. Thus everything that I will write here is based upon the first half of the project. Whether or not this invalidates what I am writing is I suppose up to you to decide. I will refer to his book as if it were a complete work - I have no idea when the second volume will be released, so perhaps there will be occasion to read and write about that one when the time comes. The book is titled 'The Autopoiesis of Architecture'. Autopoiesis is a neologism from the Greek, which means 'self-making' (it can also mean something else too, which I'll get to eventually). Schumacher has gotten the term from German sociologist/philosopher/theorist Niklas Luhmann, who in turn got it from biology. It's worth noting here that Schumacher reckons his work (henceforth AoA) is an application of the work of Luhmann to Architecture. If, like me, you've not had occasion to read Luhmann's work, then this puts you at an immediate disadvantage. I would go further and suggest that if somebody like me hasn't read Luhmann then very few architects at all will have done so. As a bit of background research I did ask about Luhmann in the company of a mathematician/theorist/political activist/nocturnal flying mammal, and the response was something like "OH! He's that crazy right-wing German systems theorist!" And sure enough, a cursory glance at the wikipedia page for Luhmann and it would seem that he was a social-ontologist, with a theory of emergent complexity, and was what you might call a 'relationist', in that his ontology seems to be structured more around the connections and less about the objects that make them up (OOO fans take note). In fact, his theories apparently have no room for subjects at all, and if wikipedia is to be believed, they have been criticised for being rather right-wing. The other thing that's worth noting is the gargantuan size of his theoretical edifice, which apparently is of a scale and scope that rivals Marx. But, to go back for a second, who is Patrik Schumacher? He is partner at Zaha Hadid Architects, and is commonly thought of as Zaha's right hand man, and less charitably as the brains of Zaha's operation. Many of their designs of the last decade or more have been credited as 'Zaha Hadid with Patrik Schumacher', so you get the idea of his stature in the firm. He is also credited with being the main driving force behind the digitizing of Zaha's design process, which progressed from paintings to floppy shapes rather quickly from the late 90s onward, leading to much talk about pre-computer and post-computer Zaha buildings (Maxxi and the Evelyn Grace Academy are pre-computer, Guangzhou Opera House and the Aquatics Centre are post-computer, for example). As well as being at the top of the pile of the top of the league of 'starchitects', he has also been running the Design Research Lab at the Architects Association, which is, depending on your viewpoint, either one of the top post-grad programmes in all of architecture, or a fee-paying internship for those who want to work at ZHA. Schumacher seems to get a lot of flak from a number of directions, from old-school modernists, to environmentalists, to anti-theorists, to those who simply find his megalomaniacal pronouncements in public forums a little too much to take. I too have heavily criticised ZHA in my time, sometimes with more spite and venom than at others. I do not intend to be mean here - I will endeavour to be as reasonable as I can. I am approaching this as someone who has trained as an architect, has plenty of experience of digital architecture and its technologies, and some knowledge of the workings of parametric software. I am also reasonably well versed in continental philosophy and the history of modern theoretically influenced architecture. I am (overall) positive about the prospects of digital design in architecture, and also take theory to be more than fashionable nonsense. I would like to think that I am an ideal reader of this book. We can see that there are already some grand claims being made about what is going on in the text - the notion of it being a guide to action rather than just an analysis is there from the beginning. But the fact that Schumacher is deviating from Luhmann is not lost on him, and the text is peppered with occasions where Schumacher is happy to tell us that he reckons that Luhmann was wrong, leading to the final admission that "Faithfulness with respect to Luhmann's work can thus no longer be claimed." What is worth noting here is that for Schumacher, buildings themselves are only one kind of communication within the autopoiesis of architecture, indeed, buildings themselves are considered to be a 'negligible'  part of the theory. Instead, architecture is the discussion of architecture, the hypothesising of architecture, the speculation of architecture. An abstract render or essay can be as important as any building, if it connects up properly in the network, and makes allies which lead to further communications (we're very much in Latour territory here). What Schumacher is trying to do here is create a concept of architecture that would include all of the peripheral work that has been going on in academia over the last few generations to be uncontroversially counted as 'inside' the field. 'autological' i.e self-reflexive, and senses that this occurred when architecture began to import ideas from 'post-structuralism'. In this sense it was important for architects to read Derrida at one point in order to increase the complexity of architecture theory - Schumacher feels that the increased complexity of an 'autological' theoretical system makes it more effective and able to contribute to its field. Schumacher feels that deconstruction becomes more of a hindrance to architecture at this point, because it "refuses this extensive system-building endeavour and therefore can never break the cycle of Deconstruction and counter-Deconstruction." Schumacher states that the failure of deconstructive theory is in its inability to provide 'a coherent account of philosophy', and that this can only be achieved with a 'comprehensive theory of society' i.e. Luhmann's/his. He seems a little disgusted with 'deconstructive' theorists, because he feels that they overstep the boundaries of architecture, and thus become if not irrelevant, then at least useless to the architecture's forward march. Basically, theory for Schumacher is utterly vital, but it is not worth a damn if it doesn't help architecture to 'innovate'. The next main section of AoA is historical. As you might have noticed, Schumacher is reframing the word 'architecture' slightly. Although he has set up the 'autopoiesis of architecture' as the emergent network within society, he already has a tendency to refer to it as simply 'architecture'. This is worth bearing in mind. Schumacher wishes to explain the 'historical emergence of architecture', ie the point when his 'autopoiesis of architecture' emerged from undifferentiated social complexity. The radical architectural projects proliferating on today's computer screens do not offer themselves as utopian proposals in the sense of elaborated proposals for a better life. […] They are open-ended mutations that at best might become catalysts in the coevolution of new life processes. […] Who is to judge and deny a priori that a strange building will not attract and engender a strangely productive occupation. […] A decoded architecture - made strange - offers itself to inhabitation as an aleatoric field, anticipating and actively prefacing its own 'détournement'. Did you get that? What is being asserted here is that the radical formal research conducted by the 'avant-gardes', by creating spatial configurations that are out of the ordinary, provide a necessary supplement to quotidian space that might possibly be taken up by an unforeseen new social arrangement. 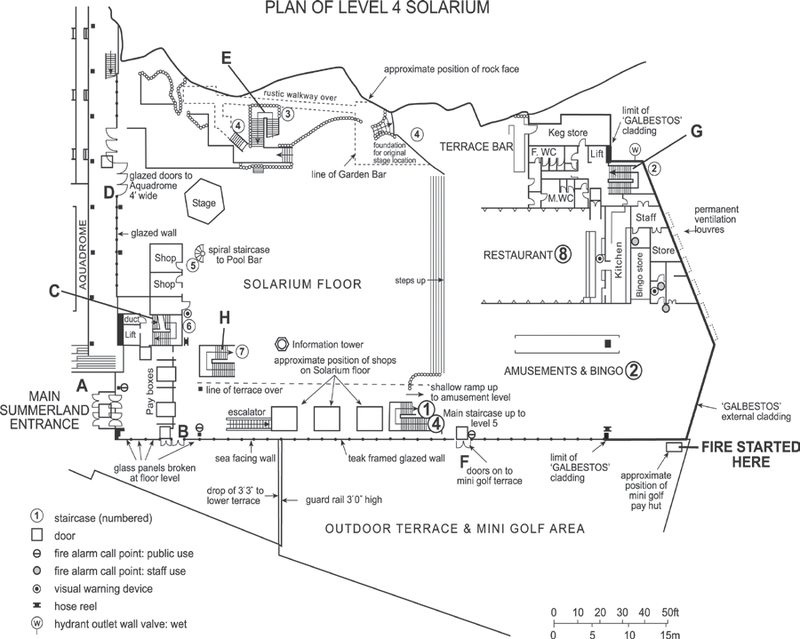 By far the longest section of AoA is the third, which goes into depth about architecture as an autopoietic system, and it is here where most of the 'theoretical heavy lifting' of the whole book resides. In this third section Schumacher first outlines exactly what it is that he thinks makes architecture architecture, and then proceeds into the elucidation of his own vision for architecture and its future. 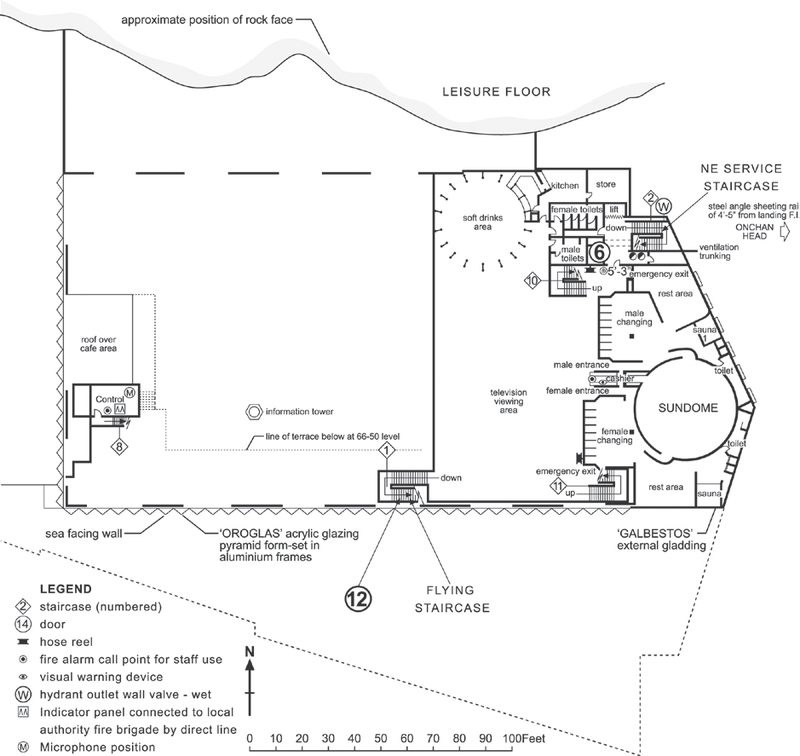 The former section contains an argument for architecture's autonomy, followed by an analysis of the process of architecture and the form/function distinction. The latter introduces the extra layer of the beauty/utility distinction, before making an attempt to rehabilitate the notion of 'style'. "There can be no external determination imposed upon architecture - neither by political bodies, nor by paying clients - except in the negative / trivial sense of disruption." Now before you spit out your tea, there is actually a technical point being made here; 'Architecture', as the shorthand term for 'the autopoiesis of architecture', has to be autonomous as it is already defined as the emergent network of architectural communication. So technically (if a little tautologically) this is correct; for example, the cost of the building is an economic aspect of a building object, and by definition is not a part of the 'autopoiesis of architecture'. The budgetary constraint placed upon a building is not an architectural constraint, it is an external 'irritant' which can only be approached 'architecturally'. 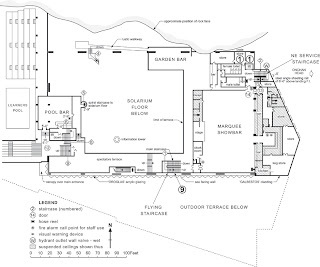 According to Schumacher, the 'elemental' architectural communication in architecture is the design decision, which is embodied in the elemental vector of architectural communication, which is the drawing. 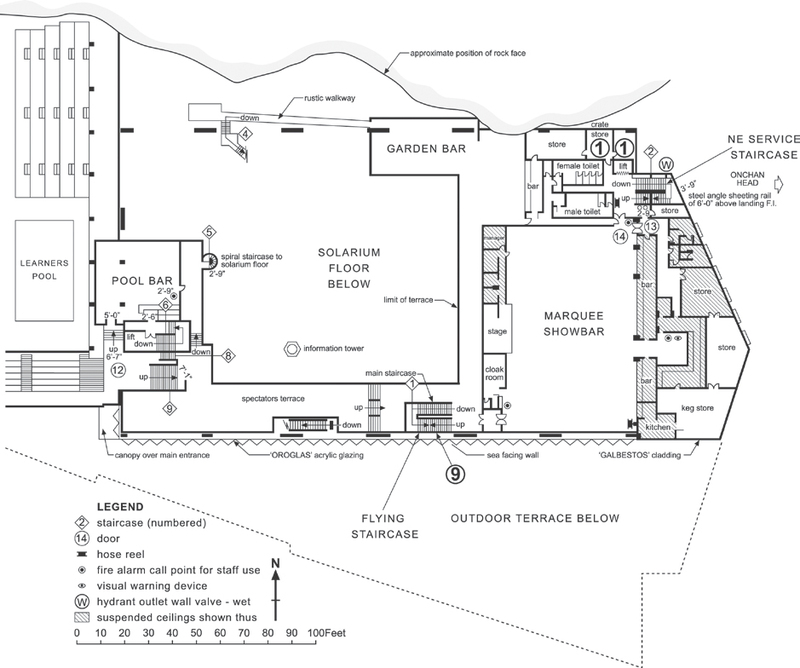 All of the external constraints that an architectural project must pass through are translated into design decisions, which are then communicated as drawings. The client of a building is not 'inside' architecture, but the pressures they exert must be translated into issues 'within' architecture. How are external irritants changed into internal architectural issues? Schumacher states that this is down to the 'lead distinction' of form/function. Any pressure that imposes upon the autopoiesis of architecture is transformed by forcing it through certain questions: "The total domain of architecture - the totality of its issues - is dissected by the distinction of form and function". Now, this might at first sound rather obvious, but there are interesting aspects to Schumacher's way of seeing form & function. First of all, this distinction understood this way doesn't have to be foundational - it can be seen as an emergent property, thus it is protected from idealism. It gives us a very simple way of mapping architectural communications, for example, the process of designing modernist buildings was obviously more strongly concerned with function, while postmodernism was far more concerned with formal questions. As the process of design proceeds, at any point one of the two terms can be used as a guide to move further on in the process; they help keep the complex activity of design moving forwards. Finally, if anything crops up that cannot be placed into this framework, then it is of no consequence to architecture. Form/function allows architecture to maintain its differentiation from other social systems. On top of this, Schumacher brings in a further binary here, that of the beauty and utility. This is the introduction of value into form/function. Beauty is good form, and utility is good function. Beauty & utility can be seen as two terms that all possible communications within architecture can be analysed with. As a metaphor we might think about how any point in two-dimensional space can be explained as the conjunction of an x and a y value. In the same way, a formal and functional analysis will place any design communication at a point in the autopoiesis of architecture. It's worth noting here that this is a rather significant deviation from Luhmann, who describes binary codes such as legal/illegal (legal system), or true/false (science). Architecture has what Schumacher calls a 'double code', ie, an architectural communication has to be fitted into 'beautiful/ugly' AND 'functional/dysfunctional'. This is Schumacher's own system, which he justifies by pointing out various failed attempts to eradicate one of the axes (for example, Hannes Meyer's functionalism or Peter Eisenman's formalism). But this is still not enough; Schumacher introduces a third code into architecture, or at least the avant-garde section of architecture that he identified earlier. This is the code of novelty . Schumacher's point is that although in the mainstream of architecture there are only two questions that can be asked (is it beautiful, is it elegant? ), within the avant-garde there is a third question that puts itself forward: is it new? The reasons for this are twofold. Firstly, according to his Luhmannian framework (which he is increasingly deviating from by this point), autopoietic functions inherently become more complex; it is in their very nature to do so (Schumacher explicitly claims that a society becoming less complex is commensurate with totalitarianism, a rather Hayekian idea if you ask me). Thus an extra code of novelty is seen to allow for greater accommodation of this very complexity. Secondly, Schumacher is drawing from his own experience of being an avant-garde practitioner; in his milieu, newness has been enthusiastically taken up for the last fifteen years or so, after the relatively atemporal period of 'pomo'. Drawing has been developed as a medium of speculation that is able to depict an uncertain future state with a very convincing degree of internal consistency and detail. A drawing can cohere a large number of people around a new complex endeavour requiring long chains of coordinated activity, the results of which lie in the relatively distant future. 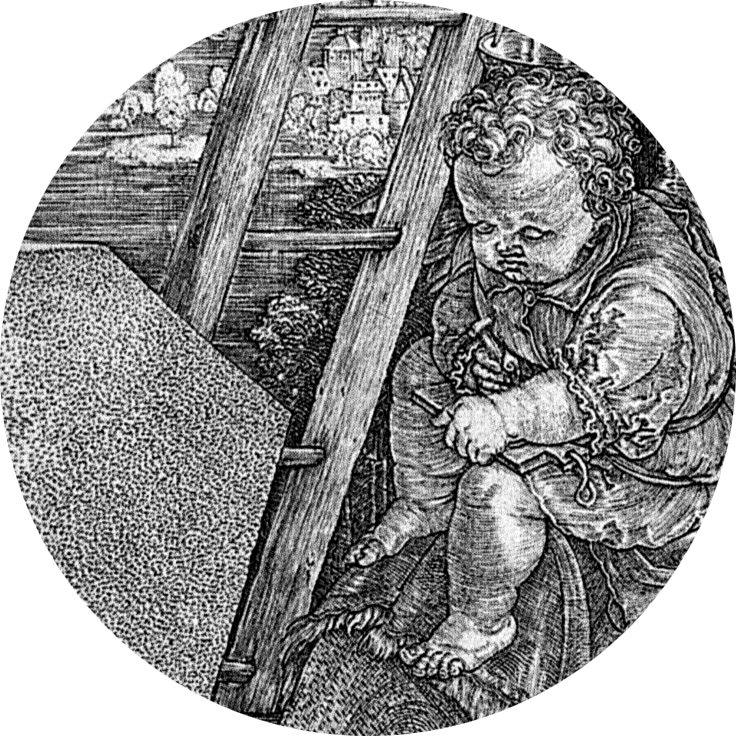 Schumacher puts forward a very convincing argument about how the drawing simultaneously makes possible the creation of architecture as well as limits what is possible within it. 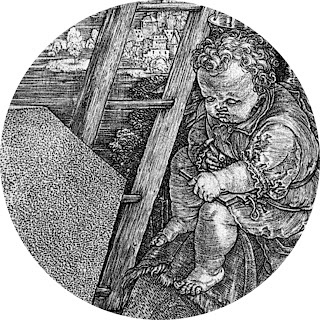 He provides a brief history of the drawing that discusses what was geometrically & cumulatively possible as a result of the drawing techniques available. So the invention of the corner perspective greatly increased the ways in which a building could be composed, and the development of tracing paper allowed for a greater level of recursiveness in the development of a design. Now, with the rapid advances in digital modelling technologies, the possibilities to recursively edit a design are increasing almost exponentially, and the level of complexity that can be stored in a digital model that need not be fully worked out constantly is also vastly greater than it was, even one generation ago. The level of modulations that are made possible using parametric modelling software do indeed make possible a hitherto unseen level of flexibility in the design process in architecture. So the fact that brand new tools are consistently being made available to the practitioner means that if the avant-garde are to be worthy of the definition that Schumacher has given them, novelty must be their priority - it is their job to test out new and under-developed potentials. An epochal style is the dominant style of a particular civilisation within a particular historical era. It is primarily in this last sense that the theory of architectural autopoiesis uses the concept of style. 'Each new style gradually emerged from the earlier one when new methods of construction, new materials, new human tasks and viewpoints demanded a change or reconstituting of existing forms.' This lucid statement of the fundamental conditions and motive forces behind the development of architectural styles is as valid today as it was then. (With respect to our contemporary condition we only have to apply the now crucial factor of the evolving design media). Ephocal styles are those […] styles that demonstrate long-term viability because they offer a systematic solution to the essential problems and challenges of the respective epoch. So - what is parametricism? Parametricism is what Schumacher believes has finally come along to rescue us from the half-century crisis that modernism has been struggling through. Postmodernism and Deconstructivism qua styles of architecture were both transitional rather than epochal styles, too attached to the critique of the overarching narrative of modernism to truly surpass it. But Parametricism, born out of the research that avant-garde architects have been conducting into new digital design technologies, has finally coalesced into the style that is ready to take architecture into the new generation. Thankfully for us, Schumacher has lucidly and simply expressed what constitutes the style of Parametricism : formally it is that everything must be 'parametrically malleable' and correlated, while rigid forms and simple repetition of elements must not be allowed. Schumacher is saying that the new possibilities to construct complex shapes mean that older formal strategies in architecture must be avoided. This is in keeping with his quest for novelty. As far as function is concerned it becomes a little bit stranger. Here, what is demanded is that the function of the building must be understood in terms of smooth 'fields' rather than fixed 'spaces' of function. This notion of field is explicitly drawn from Deleuze & Guattari's notion of 'smooth space' . The 'field', to Schumacher, is a gradiated, almost liquid transition of forms and functions that undermine simple binary distinctions like figure/ground, and allow architecture to supercede the modernist fixation with space which can only lead to false simplicity and a denial of autopoietic complexity. But after all this, WHY parametricism? What he means is that world society is so complex now that only buildings of the complexity made possible by parametric software are capable of accommodating it effectively. Modernism (a term which for Schumacher includes corporate architect of choice Norman Foster ) is not capable of properly articulating the complexity of a globalised, decentred, diversified world and its spatial requirements. And that's where I gave up. Here's the introduction to Richard Strauss' "Im Abendrot" (At Sunset), one of the Vier Letzte Lieder.